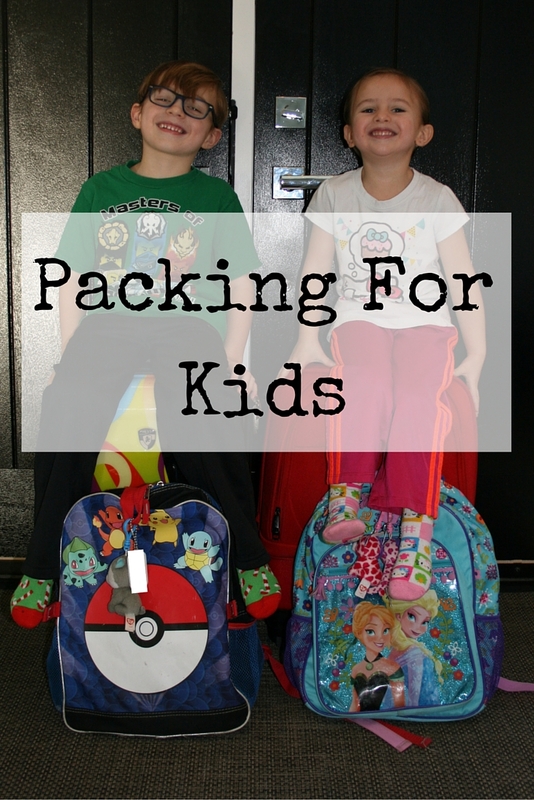 Our packing for kids motto is, “Kids, you packed it… you carry it!” It is a firm lesson that every traveller learns, only pack what you can carry. You really don’t need a lot of stuff, so be wise about what’s on your back. We have hung up our backpacks (for now), and have converted to rolling suitcases since having children but we are still very cautious about what we bring. As our kids are getting a bit older (3 & 6), they need less stuff then what we brought when they were babies. We actually cheer every time we go down by one luggage piece when travelling! All kids need are the basics so we only give them limited space for what they can bring and they need to make choices. 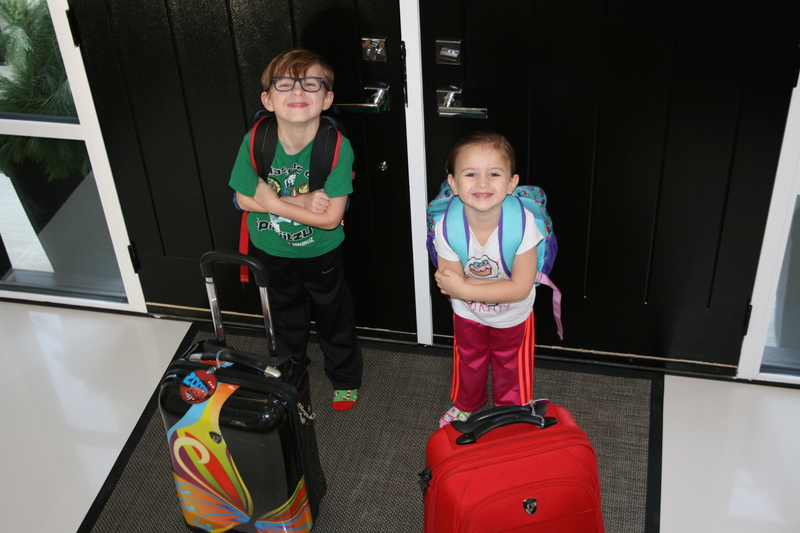 Our basic outline is each kid gets one carry-on size rolling suitcase and one carry-on backpack… that’s it. For the suitcase it is the standard size carry-on suitcase, we choose the Heys brand, but regardless of brand try to find something with the four wheels that swivels in every direction, because it makes it extremely easy for little ones to push their own luggage. Having a small suitcase for kids is useful in a few ways. First, their clothes are smaller so they can get up to 7 to 10 days of clothes in it, if we go for longer we wash. Second, they don’t overpack and have to make some decisions about what to bring. Third, if there is a cost to checking each suitcase we have brought them on board the flight and saved money (otherwise we typically check the luggage to have less things to carry around when boarding… remember no liquids in the carry-on suitcases) Fourth, they get to feel like big kids and push their luggage around and learn how to take care of their stuff. We always have our watchful eyes on it, but this teaches them independence. Their carry-on has to be a backpack. They need open hands to hold onto mom or dad, push their luggage and hold on to railing, etc. 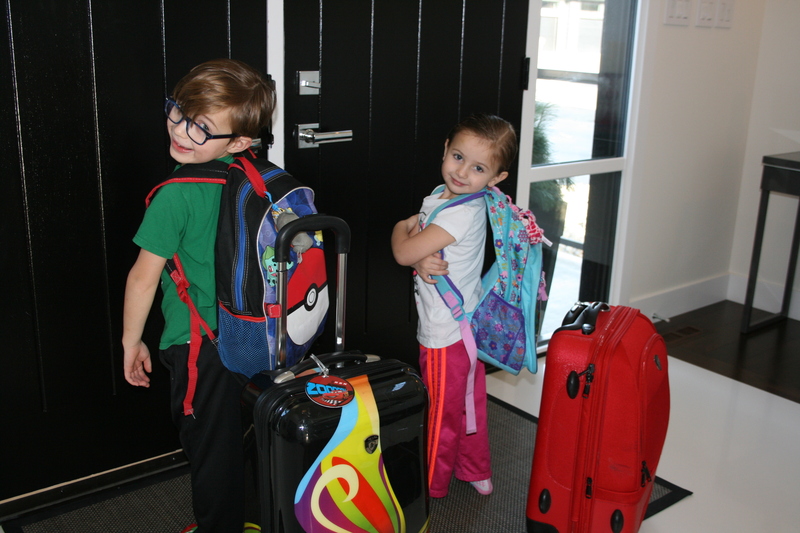 Their backpack is what holds the fun and there is only so much space for fun and sometimes fun can get heavy. They make choices about what goes in their bag, so their favourite blanket, stuffy, ipad, ear phones, colouring, books, toys, snacks, water bottle, etc. There is only so much space, so we pack it early and they walk around the house with it to see if they can handle it. There is always something that comes out and we really talk about if we forget this on the plane are you okay with that; this trigger some really special things to stay home from the trip. 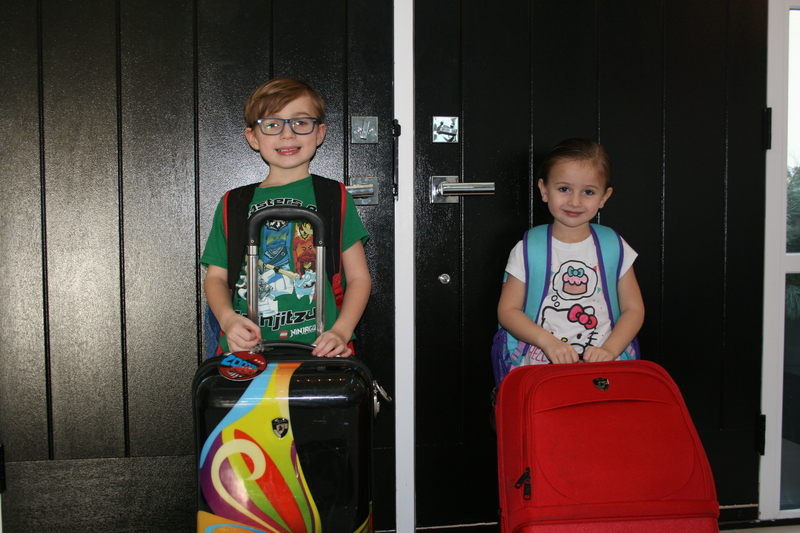 The kids generally do really well in carrying their backpacks, but in big airports or long walks mom and dad can easily grab the backpacks and either clip it on ours or hang it in front (another pro for backpacks!). 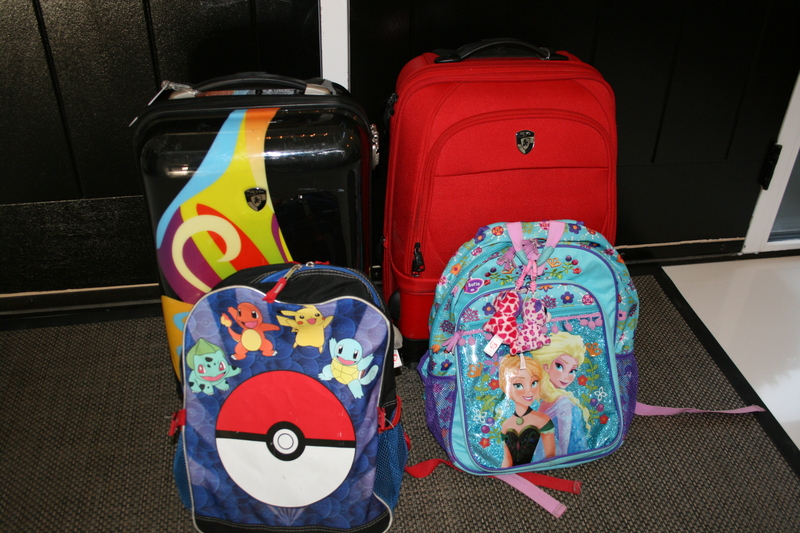 The kids also get to have some fun when they picked out their own rolling suitcases and backpacks to really be able to express themselves. They are usually the brightest and most easily recognizable luggage so that helps too on the luggage carousel! Anyways, give this a try if your kids are a young school age where this may work. We think it teaches them independence and a vital travelling lesson. This may not last forever with the small suitcases, but when the kids decide they need an upgrade to a bigger suitcase they know that if they pack it, they have to carry it! Awesome! I love that it teaches them independence and they feel like big kids. Thanks for the comments. Another great article! My daughter has the cutest suitcase a hardtop baby bird. She loves it! She also gets lots of attention as the bag stands out. She feels so BIG and proud when people comment on “her” bag. She refuses to let us help her with it as she gets such extreme pride pulling it around! Your kids look so cute with their cases! Mine are a bit older so we have gone with rucksacks for our current trip, they seem to be coping ok with the occasional moan.